Yesterday the Insurance Institute For Highway Safety showed the first results of its new passenger-side small-overlap crash test, which it conducted on 13 mid-size sedans. Here’s a look at the results of the new test that IIHS hopes will ensure equal protection for drivers and passengers alike. The grueling small overlap crash test has—up until now—subjected only the leftmost 25 percent of a car’s frontal width to a 40 mph wall impact. Meant to mimic what happens when the corner of a car hits a tree or light pole, the small-overlap crash is so difficult because of its tendency to bypass vehicles’ main structural members. But over the years, automakers have adjusted their designs, and now quite a few vehicles score the institute’s highest rating—“good.” The problem is, some automakers have skimped out on passenger-side protection, only bolstering the side that IIHS tests. That’s why, starting for the 2018 model year, any vehicle aiming to receive IIHS’s TOP SAFETY PICK+ award must score a good or acceptable rating in a new passenger-side small overlap test. The test is essentially just like the standard small overlap test that IIHS has been conducting since 2012, except with the rightmost 25 percent of the car’s frontal width impacting a wall at 40 mph, and with both a driver and passenger dummy on board. Last year, IIHS ran a study on seven small SUVs that scored a good rating on the standard small overlap test to see how well their passengers would be protected in an equivalent crash on the right side. What IIHS found was that only a single test subject—the Hyundai Tucson—managed readings that correspond with a “good” rating. Four of the vehicles tested—the Toyota RAV4, Nissan Rogue, Subaru Forester and Mazda CX-5—sustained significantly more intrusion on the passenger-side of the cabin than on the driver-side, indicating that the automakers were more concerned about a driver-side small-overlap crash than one on the passenger-side. The circle in the photo above shows an example of how an automaker—in this case, Toyota—designed specifically for the regular, driver-side test. The photo shows the left extremity of the front bumper tied into the main longitudinal rail, while the passenger-side seems to lack that extra bolstering. To achieve [better small overlap protection], manufacturers might use a different type of material or add a few millimeters of thickness — changes that can’t be discerned from a visual examination. It’s likely these types of modifications were made to the Forester and CX-5, but only on the driver side. It’s not surprising that automakers would focus their initial efforts to improve small overlap protection on the side of the vehicle that we conduct the tests on...In fact, we encouraged them to do that in the short term if it meant they could quickly make driver-side improvements to more vehicles. As time goes by, though, we would hope they ensure similar levels of protection on both sides. But now, to combat the disparity between front driver and front passenger safety, the institute began conducting the first official passenger-side small overlap crash tests on 13 vehicles that received the highest rating on the standard small overlap test. As you can see in the table below, one of those vehicles—the VW Jetta—scored an acceptable overall rating, and two—the VW Passat and the Chevy Malibu—were only marginal. The midsize cars we tested didn’t have any glaring structural deficiencies on the right side...Optimizing airbags and safety belts to provide better head protection for front-seat passengers appears to be the most urgent task now. When we published that research, we said we were considering adding a passenger-side test to our awards criteria...Clearly, some manufacturers were paying attention. Many of the cars in this group are equipped with improved passenger airbags that appear to be designed to do well in our test and in an oblique test that the government is considering adding to its safety ratings. 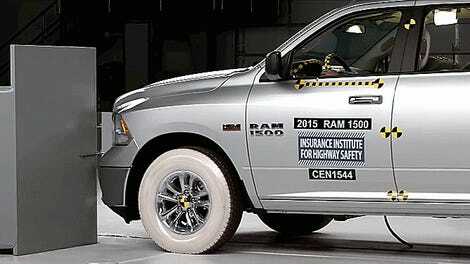 The IIHS’s small overlap crash tests are a big deal. Last month, when I visited Germany to speak with Porsche engineers about the Cayenne, I learned that the company had to add 110 pounds to the SUV specifically to protect for IIHS’s small overlap crash test. The month before that, I spoke with Mazda engineers, and learned that they, too, added provisions to their next-generation platform to protect against IIHS’s small overlap test. In fact, as of June, 2016, IIHS said 13 manufacturers had made structural changes to 97 vehicles since the test was introduced in 2012. The effects of IIHS’s small overlap crash test on the auto industry have been enormous, and this new passenger’s side test is likely to have a significant impact on the jobs of body-in-white and restraints engineers as well, even if it appears that many automakers already have decent structural provisions in place.